This is the revealing portrait of a prolific singer, songwriter, and performer of country music. Mega country music hits like 'City Lights,' (Ray Price), 'Tips of My Fingers,' (Roy Clark, Eddy Arnold, Steve Wariner), 'Once a Day,' (Connie Smith), 'Saginaw, Michigan,' (Lefty Frizzell), and many more flowed from his pen, making him one of the most decorated songwriters in music history.Then he came to a point in his career when he questioned if what he had to say mattered anymore. Music Row had changed, a new generation of artists and songwriters had transformed the genre, and the Country Music Hall of Fame member and Grand Ole Opry star was no longer relevant. By 1990, he stopped writing. Bad investments left him near bankruptcy, and his marriage was falling apart. In Nashville, he was a museum piece-seen only as a nostalgia act. Anderson was only in his fifties when he assumed he had climbed all the mountains he was intended to scale. But Anderson, a product of a long-gone Nashville, worked to reinvent himself, and this biography documents Anderson's fifty-plus-year career-a career he once thought unattainable. Today, thanks to the support of musical peers and friends who believed in him, he continues to forge the path of lyrical integrity in music, harnessing his ability to craft a song that tells a familiar story, grabs you by the heart, and moves you. Anderson is the only songwriter in country music history to have a song on the charts in each of the past seven consecutive decades. 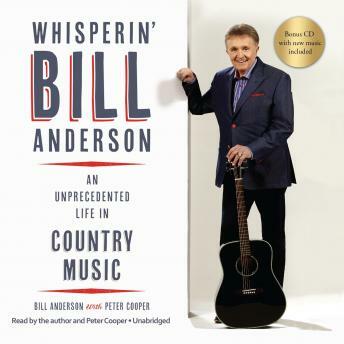 A six-time winner of the Song of the Year Award and recipient of the BMI Icon Award, he has taken home many CMA and ACM Award trophies and garnered multiple Grammy Award nominations.With anecdotes of Anderson interacting with the superstars of American music, including such legends as Patsy Cline, Vince Gill, and Steve Wariner, this book highlights Anderson's trajectory in the business and his influence on the past, present, and future of the genre.Includes bonus music tracks An Amazon.com Bestseller in Country & Folk Biographies. Longlisted for the Grammy Award for Spoken Word Albums.